We may be Innkeepers, but we are also parents of young kids (7,5, and 3). Our regular policies do not allow for kids under 12 (too many parents getting away from their kids for rest and respite), but we are bending our rules so you can enjoy a great place to stay with your family, while visiting the Hands On Children’s Museum. From first hand experience, it has to be the absolute best children’s museum in the country. The new location has only been open for a year, and continues to get better every month, featuring special events and new activities all the time. Its core displays and activities are enough for a days entertainment. Add in the special events and seasonal activities and it gets even better! 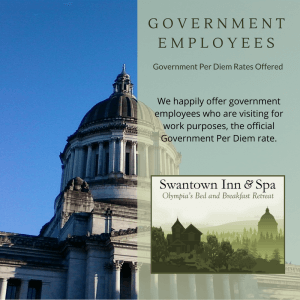 The package is designed to make the most out of your trip to Olympia. We offer four guest rooms all with a King bed and private bathroom. You get them all! The plan is you come with another family, all the adults get a private room and each set of kids get a room too. If you have a baby we do have a pack and play we can set up in your room. 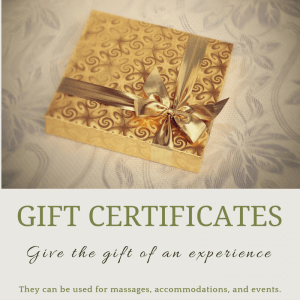 By coming with another couple you have the oppurtunity to take turns with the kids, and then perhaps get a couples massage at our on site day spa. The children’s museum even has a number of nights where they offer babysitting so you can go for dinner downtown, while your children enjoy the museum under the supervision of trained professionals. Two night stay including all four of our guest rooms. Gourmet three course breakfast each morning (if the kids are not in to fancy food then we will make panckaes for them!). Entrance to the Hands On Children’s Museum (HOCM). Massage at our on-site Day Spa. The cost for this package for months of January, Febrauary and March of 2014 is $999. Weekdays or weekends, subject to availability. Living in Olympia with three little kids of our own we know so many things to do! The WET Science Center (across the road for HOCM and free). Just to see all of those will take over a week! So if you need extra nights they will be an extra $499 for all four rooms.